There are some many ways in which we can reduce energy consumption in our daily life-and we at Envirogadget always emphasize that small such steps can lead to bigger results for the whole of mankind. A systematic form of reduction would not only allows us to save a whole lot of energy but would also decrease the carbon footprint involved in generation of electricity. Lutron Electronics is a Pennsylvania based company that offers a host of energy saving solutions for your home and office..
One such product is the C.L Dimmer for CFL and LED bulbs. The dimmer set the right luminance of the bulb as per the requirement and save a lot of energy by dimming the bulb when needed. It can be used in your bedroom, living room, kitchen as well as in the basement, and is set to keep the bulb on while being dimmed and also reduces excessive Flicker. It also keeps the lights on even in case of voltage fluctuations and ensures that they turn on at all light levels. The dimmer can also be used for normal incandescent and halogen bulbs. 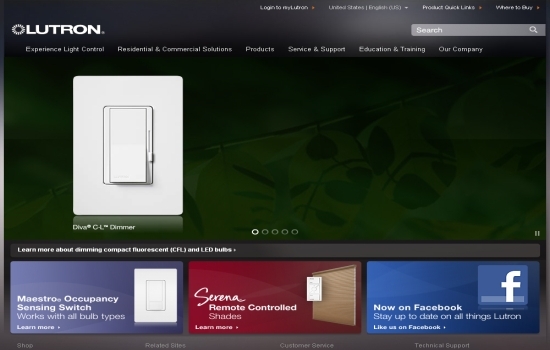 You can access the list of bulbs the CL Dimmer supports by accessing the below link. You can also use the store locator link at the top of the page to check out for retail stores selling the CL dimmer in USA and Canada. Another useful product amongst their range is the Occupancy sensing switch which automatically turns on the lights when you enter the room and turns them off when the room is empty. This product is very useful in this jet-packed age where we often tend to forget turning off the lights while leaving the room. I am quite sure that such a situation is very common in most of households, and all the more when there are children around. Automatically shutting-off the light would ensure that there is no loss of power. Apart from this, the Occupancy sensing switch also comes with a light detection feature which turns on the light only the surroundings are dark beyond a certain level.This can save your energy bills and can also save energy. You can check more about this product and can know more about all their energy saving solutions by accessing their site.